The first stage of dental implants requires a small metal screw or post to be placed directly into the jawbone. Here, your jaw will begin to grow extra bone around the post through a process called ossification. Creating this solid foundation is essential to a successful dental implant. Don’t worry about the post being exposed; your dentist will place a temporary crown on top while it heals. After the post has healed and properly fused to the jawbone, the abutment is placed on top, acting as a connector between the post and your temporary crown. 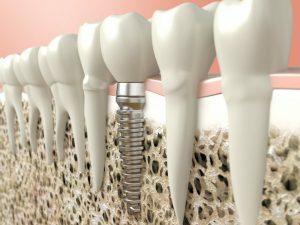 It essentially screws into the healed implant and gum tissue heals around it, sealing out bacteria and further protecting the post. During the second and final phase of the treatment, known as the restoration phase, a tooth is designed to meet your exact specifications. The tooth is typically made of ceramic material, sharing the closest aesthetic to your current teeth. The permanent crown should be treated just like the rest of your teeth, just remember to tell your doctor if it ever feels loose. While natural teeth are designed to have a little “give”, implants are very secure and shouldn’t move at all. Any signs of a loose implant should be reported to your dentist upon discovery. If your doctor recommends a bone graft as part of your dental implant procedure, there’s no reason to worry. Bone grafting has become a common practice for dentists across the country and is relatively simple. When you have a missing tooth, the empty spot leaves more than just gum tissue. Inside it is a shell of bone in your jaw known as alveolar bone, which is exclusively used for supporting teeth. To prevent the body from resorbing this shell of bone, the dentist will create a ridge preservation graft from special bone grafting material before placing the implant. A bone graft is when a doctor takes a small sample of bone to produce more bone material, typically for people with thinner or softer jawbones. This process can take several months to produce, but without healthy preexisting bone the implant cannot be placed at all. Consider scheduling a consultation with your dentist to see if dental implants can work for you! Dr. Mahima Gupta completed her four-year dental degree B.D.S. and her one-year residency in India before earning her advanced education dentistry degree D.D.S. at New York University. She believes personalized care with one-on-one consultations provides patients with the confidence they need to visit their dentist without fear. To learn more about her practice and the dental implant process, contact her at (469) 729-7707 or visit her website.